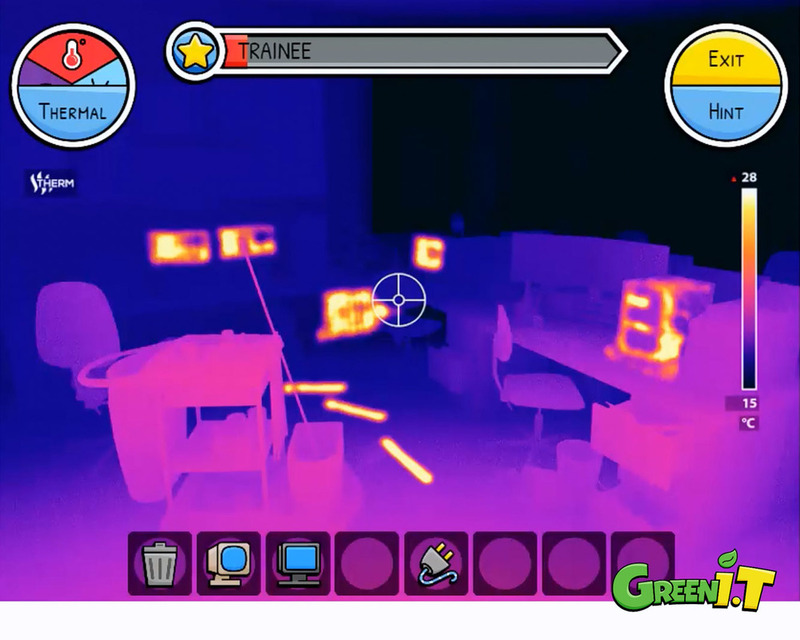 IS IT GREEN This serious game teaches users how to begin conducting an energy audit with in their workplace. A learning tool for all business sizes! Green IT enables the simple implementation of environment friendly solutions. All businesses can enjoy the effects of Green IT! GREEN IT PRINCIPLES Through game play, learners learn about the energy inefficient issues often found in the workplace. Green IT teaches how to recognise these problems and solve them. Following these methods, businesses can make considerable financial savings and help the environment. Great benefits for green businesses! This serious game is a great source for established businesses who hope to turn their business into a greener workplace. Green IT is a brilliant tool for Start-up companies too. Start-up businesses who want to do their part for the environment and cut costs, should use Green IT. EASE OF PLAY This serious game respects the short amount of time available to business professionals. Green IT is intuitively interactive. It uses realistic scenarios so the learner can draw parallels with their own business. Built with HTML5, Green IT is compatible with Windows and Mac. There's no download or game installation. Updates are instantly installed with no user involvement. There's even an option for mobile deployment! 7 languages to choose from currently, this business tool enables green IT adoption worldwide. DESIGN Green IT is part of an EU project: Is IT Green. That in mind, characters were designed to be relatable, regardless of background. Bright, visually stimulating appearance were used, deviating from the usual game design appearance. Environments are representative of many typical workplaces. These design choices coupled with the engaging game play helps assimilate the principles of green IT. FUTURE APPLICATIONS The applications for this game type are endless. Serious games are adaptable. They offer a unique, engaging experience, heightening the thoroughness of training. Serious games are the perfect tool for corporate training. For more applications of serious games please browse through our other projects.